New York Pizza is a Dutch delivery and takeaway company that is the market leader in the Dutch market with more than 260 branches. The company opened its doors in 1993 with a branch on the Spui in Amsterdam and since 1996 has also been focusing on the delivery market. In addition to pizzas, the range also includes pasta and hamburgers. The company works according to a franchise formula and tries to support its franchisees as much as possible in marketing activities. All branches make expressions for national campaigns via manual DTP and the head office. Managing this with mail and Excel became too costly, complex, time-consuming and very susceptible to error. 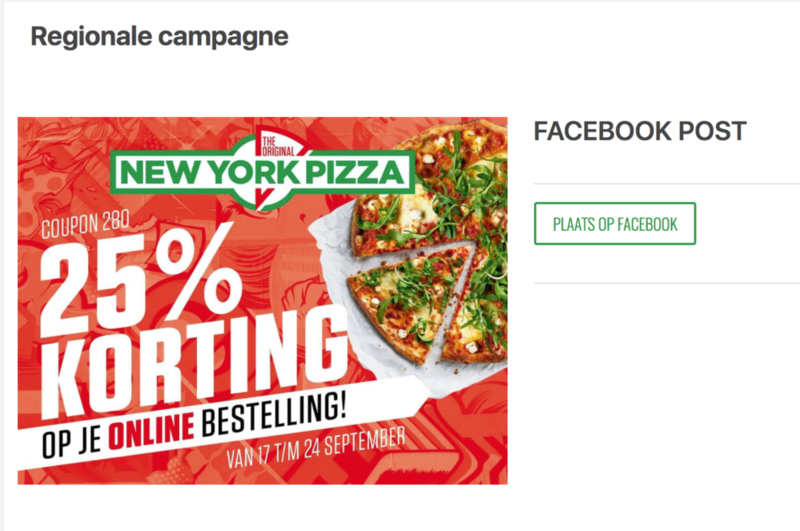 New York Pizza wanted a solution in which the location managers could be supported as much as possible in (local) marketing. Uniquely coupon codes are generated and added to the statements. With our Local Store Marketing tools, two types of campaigns can be run. With local campaigns, the franchisee can bring his product or action to the attention on his initiative. In addition, the head office prepares a national campaign several times a year. The franchisees log in and choose from the predefined materials in the theme of the promotion. In both cases, Marvia creates a link with printers, distributors and social channels. Thanks to our WYSIWYG editor, the preparation of the campaigns requires no specialist knowledge and the employees have time to focus on baking the tastiest pizzas. Check out the other solutions that our Local Store Marketing software has provided.